Once again the Middle East has fallen victim to conflict and Cyprus witnesses the confirmation of its geostrategic importance. Within this international and European context the 35th "Note" by the Robert Schuman Foundation reveals to us the complex issue of Cyprus. 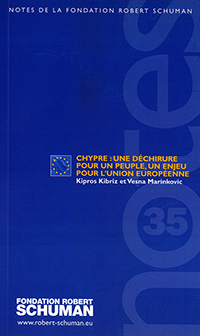 Since the Republic of Cyprus joined the European Union in May 2004 the Cypriot issue has been at the heart of European debate and notably of the enlargement of the EU since the opening of membership negotiations with Turkey in October 2005. Primarily this paper highlights the key points in the island's history and shows how the difficulties in establishing dialogue between the Greek and Turkish communities seem to have led the matter to be mired. Several major crises have affected Cyprus but, to date, no solution has been found to bring its division to an end. The paper then stresses that with the possibility of Turkey joining the EU discussions about solving the Cypriot issue which were postponed after the failure of the referendum organised by the UN in April 2004 might be rekindled. It develops the various future possibilities to settle the Cypriot affair that has now become an extremely important European issue.